What fun things can I do with Systemd in Linux? 92. How do I sort incoming mail based on receiver address into different folders? Sometimes you have two e-mail addresses to the same e-mail account. They both end up in the account jny25782@user.uu.se which in the catalogue has the full name Jerker Nyberg von Below. 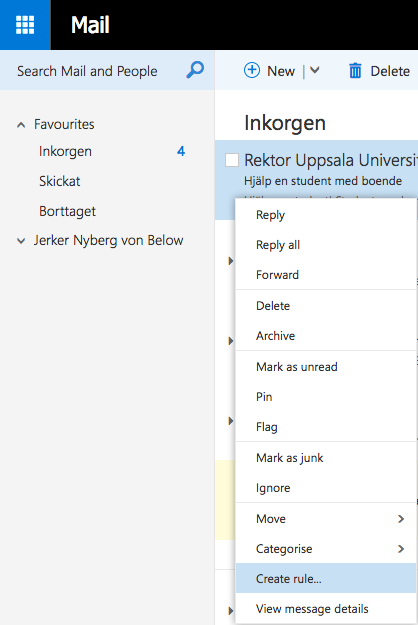 In our (the university) setup of Exchange/Outlook it is possible to base the rule on the account receiving the mail, but not on the original address receiving the mail (the envelope header). In order for all mail to be correctly sorted the envelope header must be used. But in our setup it is not possible to insert dynamic rules in that stage as a user. This makes is problematic to sort mail which has both addresses as receivers. (both jerker.nyberg@bmc.uu.se and jerkertestar@bmc.uu.se). Only one mail will end up in the account. Mailing lists are also problematic but may be working because they are handled by an external system (Sympa). So it depends. It usually works. And sometimes when it do not a few additional rules may help. But be sure to read both your incoming folders. Enter the Uppsala University webmail at https://mail.uu.se/. You may want to change the name for the rule. 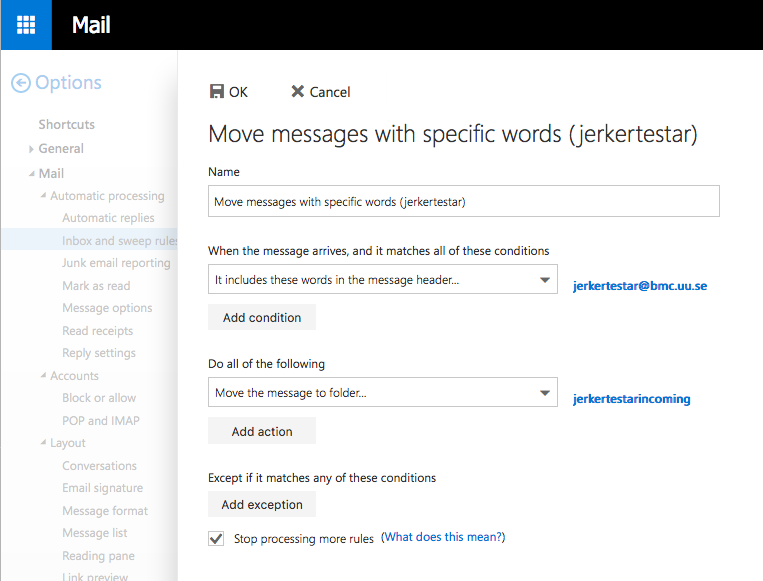 Click on the right of the condition on the blue text and then write one of the e-email addresses you would like to move to a separate folder. Then pick a folder you would like to move the message to. You may want to create a new folder. Try your new rules by sending messages to your different addresses.